This award, established by NSLPS in 2002, honours one of Nova Scotia's biggest supporters of lighthouses. Craig Harding fought long and hard to save the historic Cape Forchu lighthouse in Yarmouth, but lost his battle with cancer just a few months after the municipality officially took possession of the lighthouse. 2018: Rear Admiral John Newton who was instrumental in getting the gas house on Sambro Island stabilized and is currently looking into the preservation of the mystery lighthouse on Eastern Point Island outside off Blue Rocks. 2017: Larry Peyton and Cory Webb who are currently creating free online videos of NS Lighthouses using a drone and accompanying musical soundtrack. As of April 26, 2017 they have filmed 107 lighthouses and have 50 more to do. 2016: Janet McGillen who was instrumental in moving Gabarus Lighthouse from its original site on an now rapidly eroding cliff to a safer more stable location. 2015: Tom Roberts, manager of navigational aids for the Canadian Coast Guard for his help in saving lighthouses. 2014: Kathy Brown and Peter MacCulloch for their work over 20 years on the website and lighthouse data. 2013: Dan Conlin who has been a board member, past president, event co-ordinator and a constant source of support for saving lighthouses. 2011: Sandy Point Recreation Group for for their lighthouse preservation. 2010: Five Islands Lighthouse Preservation Society for saving the Five Islands Lighthouse, a project that has required years of work and perseverance. 2009: Hampton Lighthouse and Historical Society for preservation of the Hampton Lighthouse which was passed over by DFO to the Society in 2001. 2008: Barry MacDonald, for his years of work to get the Heritage Lighthouse Preservation Act passed. 2007: Chris Mills, for his years of collecting oral history from lightkeepers and their families and for his two books abate Nova Scotia’s lights and keepers. 2006: Port Bickerton Area Planning Association for saving the Port Bickerton Lighthouse and opening the Nova Scotia Lighthouse Interpretive Centre there. 2005: Stanley Spicer in recognition of saving the Spencers Island Lighthouse in the late 1980's, the first lighthouse in Canada turned over to a community association. 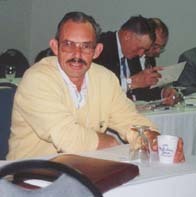 2004: Rip Irwin, in recognition of his long-standing work on behalf of lighthouse preservation. 2003; Medway Area Communities Association, for saving the Port Medway Lighthouse. 2002: Walton Lighthouse Society, for care of the Walton Lighthouse. 2001: Craig Harding, Friends of the Yarmouth Light Society. Craig was born in Overton, Yarmouth County. He loved the sea and as a young man, he worked as a steward on the Canadian Coast Guard ship Narwhal. In 1969 Craig joined the Canadian Air Force as a meteorological technician, serving on ships and bases across the country. After retiring from the forces in 1988, Craig returned to live at Cape Forchu. He continued to stay in touch with the sea, working on the ferry Bluenose as a deckhand, and on Beaver Marine tug boats along the eastern seaboard. It was Craig's interest in the Cape Forchu lighthouse that revealed the depth of his passion for the beacons that guide ships at sea. The Cape Forchu lightstation is a Yarmouth landmark. In 1993 the last lightkeepers departed, leaving the tower locked and the keepers' dwellings empty. As with other lighthouses in Nova Scotia, there was a danger the houses, including a 1912-vintage duplex, and other surplus buildings, would be demolished or sold off by the federal government. Craig, along with his neighbour Gert Sweeney, joined the Friends of the Yarmouth Light Society to help save the lightstation. The group worked tirelessly to restore the site, opening a museum in the former keepers houses. It wasn't glamorous work -- shingling, painting and putting in septic systems, as well as keeping up with regular maintenance in a harsh marine environment. But Craig and the Friends persevered. After more than five years of fighting the weather and bureaucratic red tape, their work finally paid off. On June 1, 2000, Larry Wilson, the Coast Guard's Maritimes Regional Director, handed the management of the Cape Forchu lighthouse over the municipality of Yarmouth. The transfer meant the future of the lightstation was finally secure. The municipality took complete ownership of the lightstation in 2001. It is now a Municipal Heritage Property. Craig's passion, tenacity and dedication showed that Nova Scotia lighthouses can be saved. In his honour and as a permanent "Thank you!" 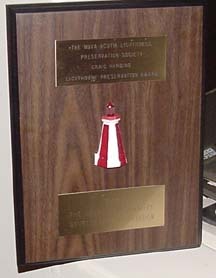 the Nova Scotia Lighthouse Preservation Society Awards the "Craig Harding Award," annually at the Annual General Meeting, to a group or individual who has made an outstanding contribution to saving Nova Scotia's lighthouses. The award consists of an engraved pewter plaque specially created by Amos Pewter for the Society.